Thousands of protesters raise umbrellas during a rally to support young activists Joshua Wong, Nathan Law and Alex Chow in downtown Hong Kong, Aug. 20, 2017. Hong Kong’s vigorous activism once earned it the nickname “city of protests.” But these days, the Chinese territory has become the city of prosecutions. Three years after the city’s massive strike for free elections, what’s now called the Umbrella protest, the Hong Kong government is pursuing charges against several dozen activists and participants. Many who face prison time organized peaceful pickets in the former British colony, a Chinese territory since 1997. Before various judges stand current and former student leaders, university professors, a minister, lawmakers and political candidates. 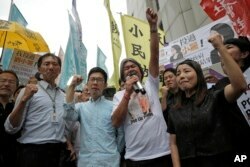 Each helped to organize or joined the 79-day strike that sought elections free from China’s intrusions. Despite weeks of blocked roads and negotiations, the crowds failed to sway officials in Beijing. 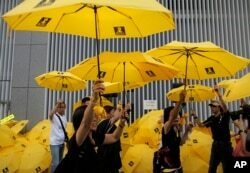 Protesters raise yellow umbrellas during a rally to mark the one year anniversary of "Umbrella Movement" outside the government headquarters in Hong Kong, Sept. 28, 2015. Last week alone, city courts heard an appeal to vacate the prison sentences of Nathan Law, a former city lawmaker and two other student leaders; began a trial of a former legislative candidate charged with inciting a 2016 riot; and sentenced several people who violated a 2014 court order to clear a protest camp. Joshua Wong, a 21-year-old student leader, appealed one prison sentence on Tuesday, and was locked up again on Wednesday for an additional three months in another case. In one of Wong’s cases, the appellate court agreed with the government that prison time was necessary to deter violence, no matter if organizers intended to follow the principles of civil disobedience. Any injuries, no matter how minor, the court deemed, would be too many. One consequence of so many prosecutions has been to dampen activism. Recent protests have been quite small, a phenomenon that leaders attribute to fatigue and concern about arrests. “People are so numb right now,” said Alex Chow, one of the students who led the 2014 fight who is free on bail as he appeals a prison term. Worldwide attention on the sentences “impairs the credibility of the government and also the legal system,” said Chow. He was headed to the University of California, Berkeley, to start a doctoral program when he was unexpectedly imprisoned in August. Newly elected lawmaker Nathan Law (C), student leaders Joshua Wong (R) and Alex Chow meet journalists outside a court before a hearing. Indeed, the chairmen of the U.S. Congressional Executive Commission on China, which monitors China’s human rights record, posted a notice on Twitter that they planned to nominate Wong and the Umbrella Movement for the 2018 Nobel Peace Prize. Despite anger over the sentences, including a march in August attended by about 20,000 people, the path to prison continues for many. Later this month, several more protesters will be tried for staging a march in November 2016 against a Beijing ruling that since has been used to disqualify six Hong Kong lawmakers. Several months later, nine of the 2014 occupation organizers will be tried. Given what’s happened in earlier cases, it’s likely that each person will be sent to prison. Most of the activists are defending themselves against minor charges, such as unlawful assembly and disobeying a court order. Yet some leaders face more serious charges such as “inciting people to incite others to cause a public nuisance.” That’s the charge lodged against Benny Tai, a law professor who first floated the idea in 2013 of a massive civil disobedience action to compel Beijing to grant Hong Kong a new elections system that would end the practice of having elites select the city’s leader. That promise of elections without China’s restrictions is mentioned in Hong Kong’s constitution, the Basic Law. In a lower court hearing in early January, Hong Kong’s new chief prosecutor refused to rule out additional legal actions against more than 700 other people arrested during the 2014 event. Hong Kong law allows the government to pursue prosecutions years after people are charged. Pro-democracy Hong Kong lawmakers of the legislature council, Edward Yiu, Nathan Law, Leung Kwok-hung and Lau Siu-lai protest outside the High Court in Hong Kong, July 14, 2017. 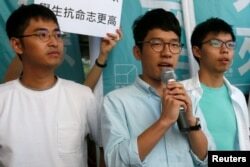 One attorney for the former city lawmaker Nathan Law told the appellate justices on Tuesday that the sentences were suppressing Hong Kong residents' constitutional rights to protest and speak out. “We must guard against making or discouraging young, idealistic persons who are doing this not for personal benefit, not to create anarchy, but to express their views,” attorney Robert Pang argued before the Court of Final Appeals. Law was imprisoned in August for inciting a crowd to join an unlawful assembly.